2001 - Community Veterans Memorial, (6.5 acres of nine major figurative groupings in bronze and granite, Memorial Park, Munster, IN. Memorial to Heroic Construction Workers, (bronze commission of the Rotblatt-Amrany Fine Art School), Miller Stadium, Milwaukee, WI. 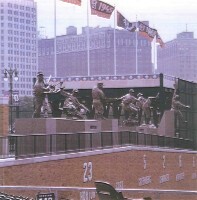 1999 – Detroit Tigers Hall of Fame Players, (five stainless steel sculptures), Detroit Tigers Stadium, Detroit, MI. Harry Caray, WGN Sportscaster for the Cubs, (white bronze), Wrigley Field, Chicago, IL. 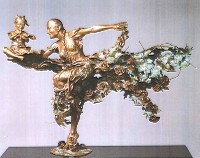 1998 – Cascading Melodies, (bronze), pending location, Private Commission, Chicago area museum. 1997 – St. Therese of the Roses and Child Jesus, (bronze), Carmelite Monastery of Philadelphia, PA.
1996 – Standing Tall, (bronze), memorial to Father John Smith, Maryville City of Youth, Maryville, IL. White Oak of Illinois, (electroform), first edition owned by McDonald Corporation, Oakbrook, IL. Designed as Chicago Chamber of Commerce Award. 1995 – The Legacy, (bronze), Annual Award for City of Hope Golf Tournament, Los Angeles, CA. 1994 – The Spirit, (heroic bronze of Michael Jordan), The United Center, Chicago, IL. Limited edition replicas in prominent collections, including U.S. President William Jefferson Clinton, Chicago Mayor Richard M. Daley, Illinois Governor Jim Edgar. Shout of the Land, (resin), City of Highland Park, IL. 1992 – The Conductor’s Hands, (electroform) Quaker Oats Corporations, Chicago, IL. Transformation, (bronze), Mayor’s Award, City of Highland Park, IL. 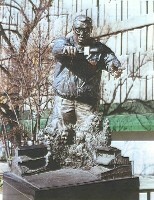 1989 – Milkovsky, (bronze), memorial to father of Melech Milkovsky, Private Collection, Tel Aviv, Israel. Second edition, Meyer Kaplan Jewish Community Center, Skokie, IL. 1978 – Wall Tapestry, (sheep’s wool and canvas), Ben Gurion Airport, Tel Aviv, Israel. 2001 – The Ottinger Gallery, (bronze, electroform and stainless steel sculptures), River North Gallery District, three person show, Chicago, IL. 2000 – Shanghai Art Fair 2000, (bronze, electroform and stainless steel sculptures) Shanghai, China. 2000 – Beaux Artes, Invitational Exhibition, (mixed media) Paris, France. 2000 – Spertus Museum of Judaica, “The Peacemaker,” (drawing, pencil on white paper), Chicago, IL. 2000 – East West Gallery, (sculpture) Chicago, IL. 1999 – Moxley-Ross & Naranjo Gallery, (group exhibition of paintings and sculpture), Santa Fe, NM. Millennium Group Show, Oakton Community College, (sculpture), Des Plaines, IL. 1998 – Tribute to Michael Jordan Exhibition, Chicago Bulls Event, United Center, Chicago, IL. Fall Show, (paintings and sculpture), Rotblatt-Amrany Fine Art School, Chicago Metropolitan Area, IL. 1997 – October SOFA Show, Anne Nathan Gallery, (sculpture), Navy Pier, Chicago, IL. East West Gallery, Miami Convention Center, (sculpture), Miami, FL. 1996 – North Shore Congregation Israel, (sculpture, paintings and drawings), Glencoe, IL. 1995 – Fall Show, (multi-media) Rotblatt-Amrany Fine Art School, Chicago Metropolitan Area, IL. Palette & Chisel Academy Show, (sculpture) Tavern Club, Chicago, IL. Lineart International Art Exhibition, (sculpture and painting) Ghent, Belgium. 1993 – Carole Jones Gallery, (paintings and sculpture), River North Gallery District, Chicago, IL. 1992 – East West Gallery, (sculpture), Chicago, IL. Portraits/Chicago, (paintings and sculpture). Chicago, IL. 1990 – Fermi Lab Invitational Exhibition, (sculpture), Batavia, IL. Carlan Collection, (sculpture), Palm Springs, CA. East West Gallery, (sculpture), Chicago, IL. 1989 – Colbys Corporate Exhibition, (sculpture), Lincolnwood, IL. Firenze Gallery, (sculpture), Lake Forest, IL. East West Gallery, (sculpture), Chicago, IL. North Shore Congregation Israel, (sculpture), Glencoe, IL. ECI Exhibition for Child Protection, (sculpture), Hilton Hotel, Tel Aviv, Israel. 1988 – Shai Danon Gallery, (sculpture), Tel Aviv, Israel. La Galleria Caesar, (sculpture and paintings), Tiberias, Israel. 1987 – Orange Plus Gallery, (bronze and marble sculptures), Haifa, Isreal. 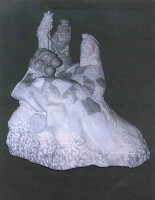 1986 – Uri & Rami Museum, (sculpture and paintings), Ashdot Yaacov, Isreal. 1978 – Madison Square Garden, 30th Anniversary of Israel, (wall tapestries, sheep’s wool and canvas), New York, NY. 1954 - Born. Kibbutz Ashdot Yaacov, Isreal. 1972-1978 – Military Service, for three years. Additional four years service as youth counselor. 1978 – Invited to exhibit wall tapestries in Madison Square Garden. 1981 – Resumed work in acrylic painting. Enriched path of self education with intermittent studies at Tel Aviv University in anatomy, drawing and painting. 1985 – Began studies at Santoli’s Studio, Pietrasanta, Italy, to explore marble and granite sculpture. 1987 to now – Continued international exhibition schedule begun in Israel, now including Belgium, China, France, Holland, Italy and across the USA, as well. 1989 to now – Rotblatt-Amrany Fine Art School, co-founded with Julie Rotblatt-Amrany, his wife. The School is an international center for the full development of three-dimensional and visual arts excellence. Became naturalized U.S. citizen. 1993 to now – Instructor in sculpture, Rotblatt-Amrany Fine Art School Greater Metropolitan Chicago, IL. 1995 to now – Instructor in sculpture, The Palette & Chisel Club, Chicago, IL. 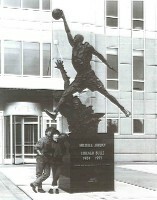 Chicago Bar Association honored the Amranys with the Award of Special Merit for Public Art, in recognition of the impact made by The Spirit, the Michael Jordan heroic bronze. The Chicago Tribune, The Chicago Sun-Times, The Wall Street Journal, Chicago Magazine, North Shore Magazine, Pioneer Press, The Northwest Herald, The Chicago Bulls Magazine, Chicago Jewish News, The Detroit News, The Times of Northwest Indiana, as well as local and national television and radio outlets have been reporting on the remarkable monuments and memorials created by the Amranys and their colleagues in the Rotblatt-Amrany Fine Art School. The Fine Art Studio of Rotblatt-Amrany is active in creating history in American Art for the last 15 years.